Anime fans should be excited to hear that a new Dragon Ball Z game is coming. 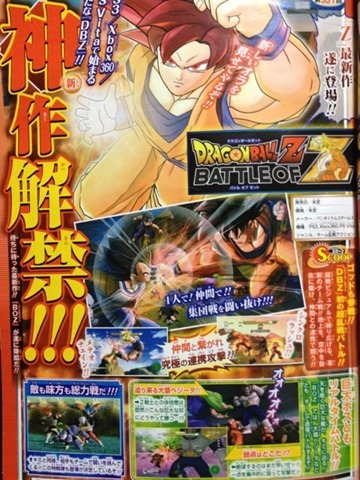 A scan from Shonen Jump Magazine announces Dragon Ball Z: Battle of Z, a new multiplayer fighting game. According to Siliconera, unlike past Dragon Ball games this one will feature eight player combat. You can have eight players fighting simultaneously or 4 on 4 team battles, both online and offline. Also, as you can see above, the best part is you can play as Super Saiyan God Goku. Dragon Ball Z: Battle of Z is coming out for the PS3, Xbox 360 and PS Vita. No word if the game is coming the West.